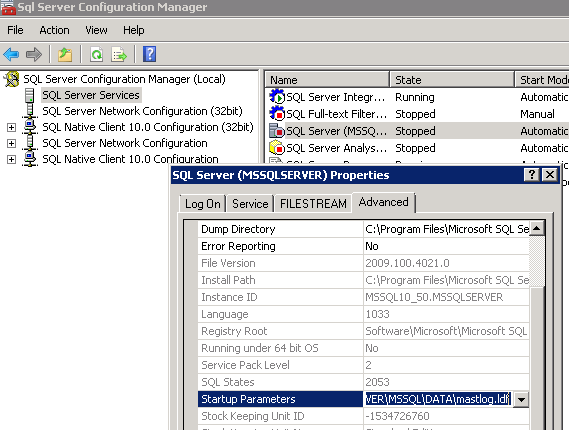 I got an error when I try to start the SQL Server service and the error message suggest me to analyze event log for further details, after I have analyzed found the following details in the event 17058. 2. Click to select 'SQL Server Services' from the left menu options. 3. On the right panel, right click on 'SQL Server (MSSQLSERVER)' and click 'Properties'. 6. Browse the Log location "C:\Program Files\Microsoft SQL Server\MSSQL10_50.MSSQLSERVER\MSSQL\Log". 7. Right click on the folder "Log" and click Properties and then to visit to "Security" tab. Now, check SQL Server service account permission on this folder and give proper access to this folder. 8. Now, Restart the SQL Server service. if you face the same error again, try to change highly privileged service account like "Local System".